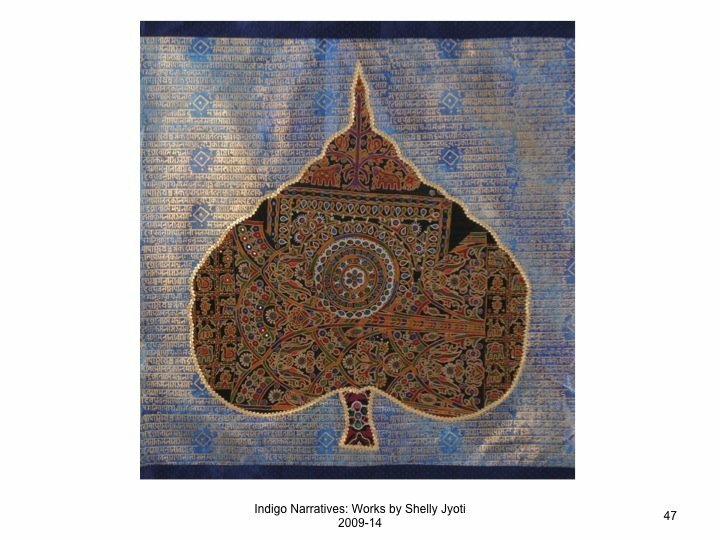 My work is centered on historical iconographic elements within the cultural context of Indian history. 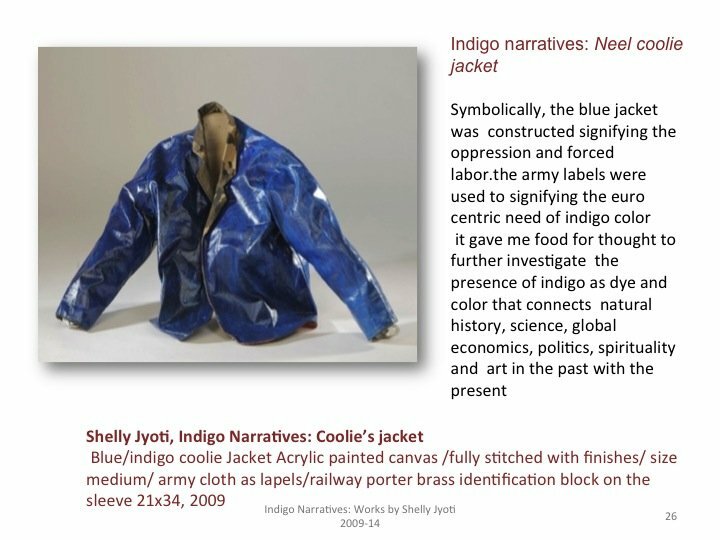 I explore and construct the hermeneutics of period histories within the social economic and political inquiry of representation and identities. 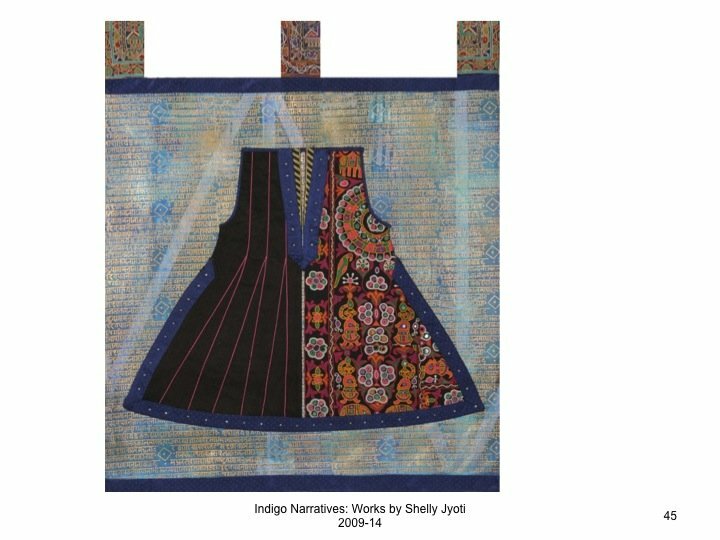 My works draw upon India’s colonial past but are also engaged with contemporary economic interchanges. 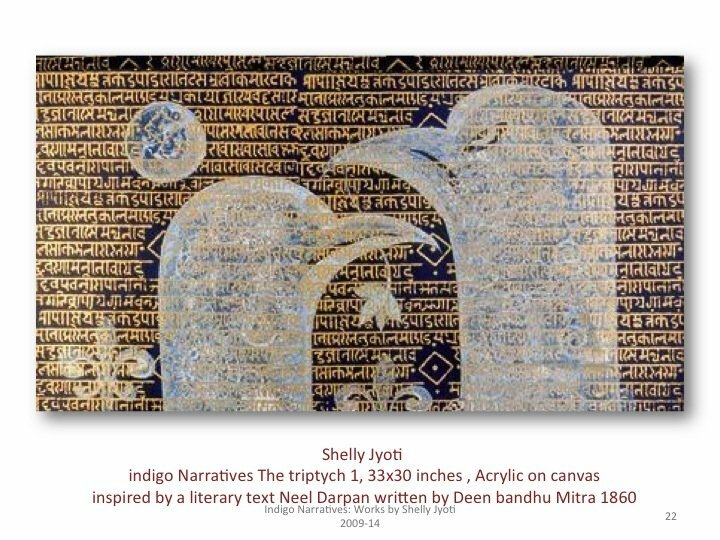 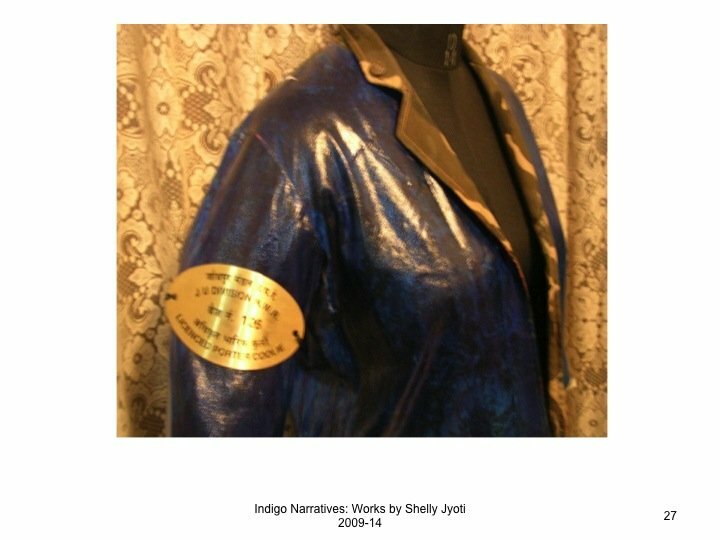 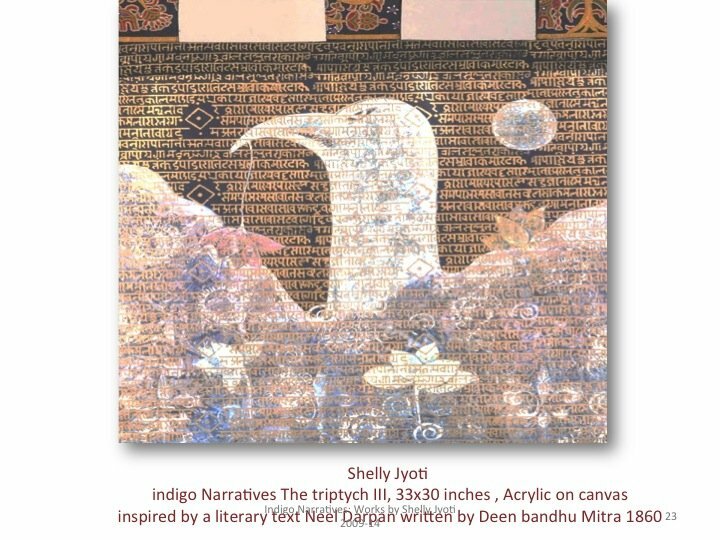 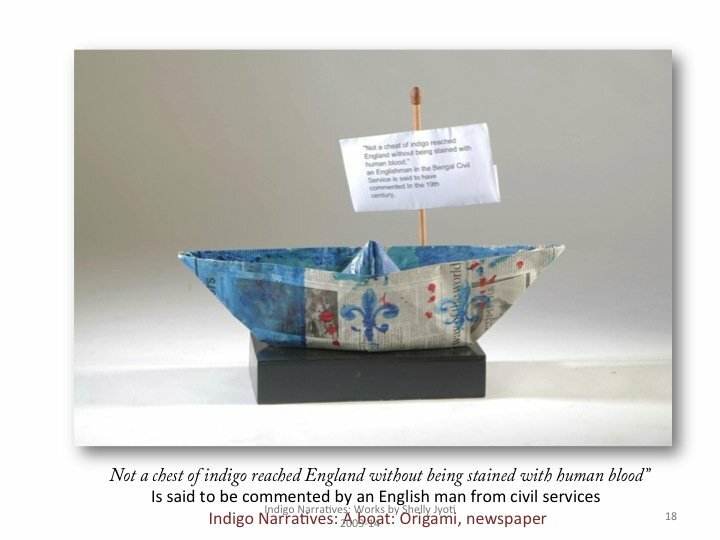 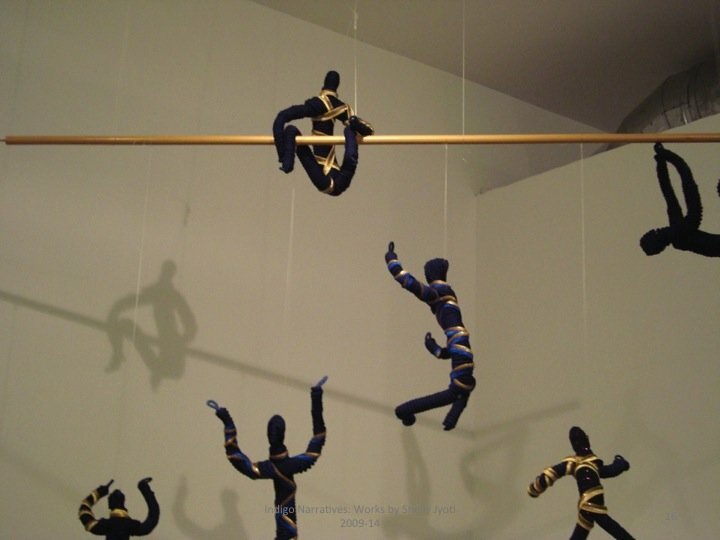 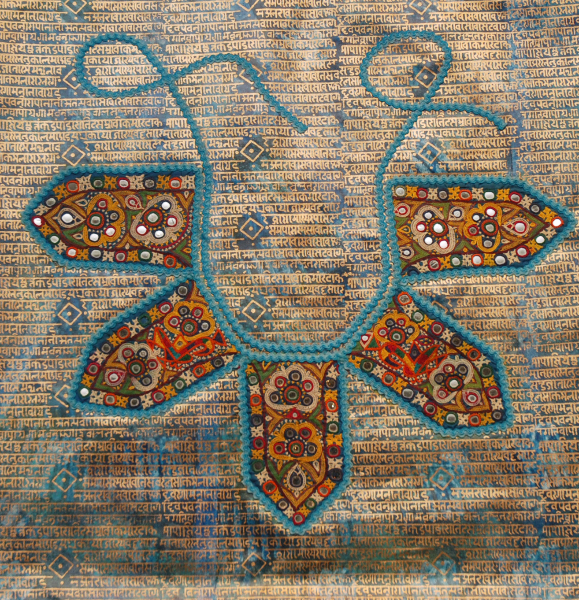 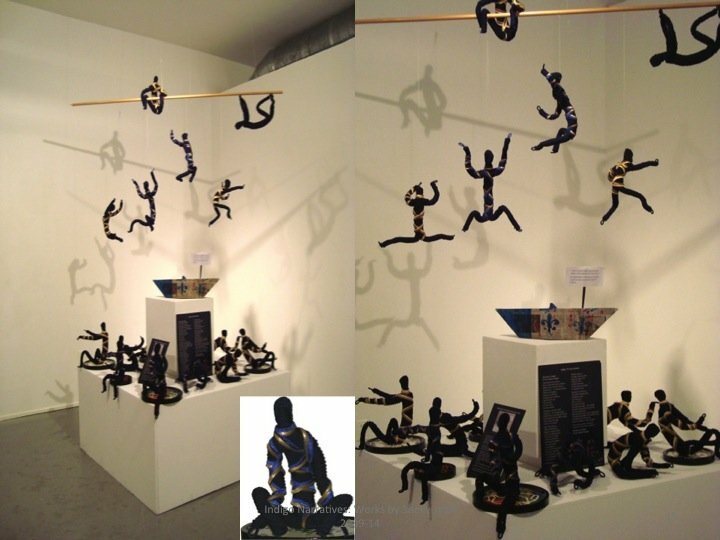 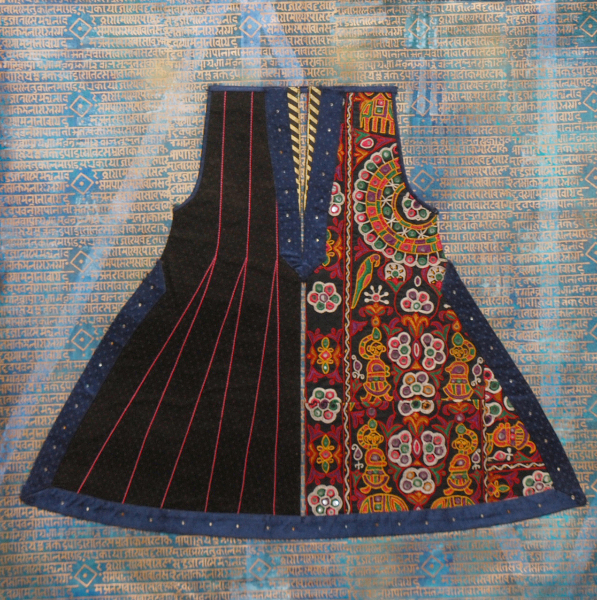 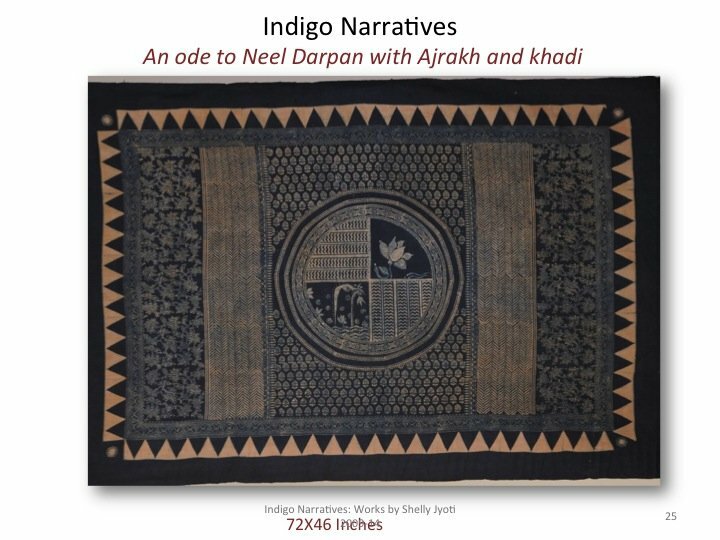 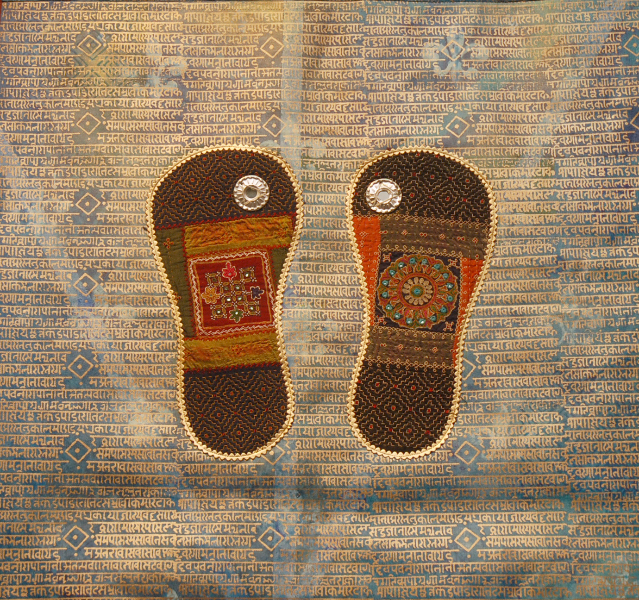 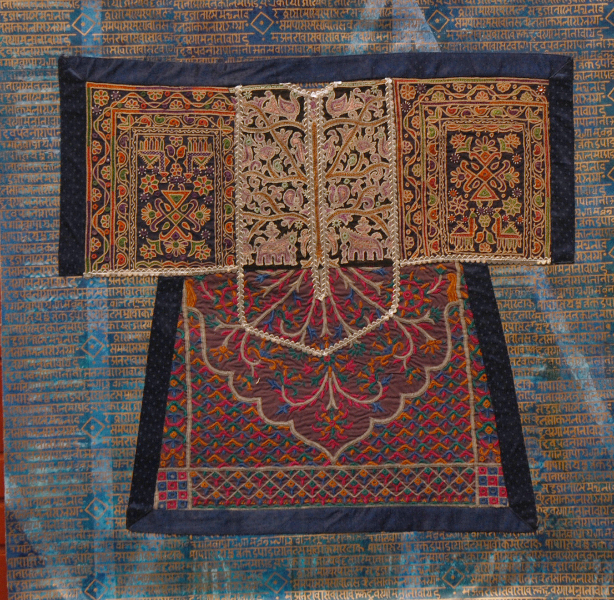 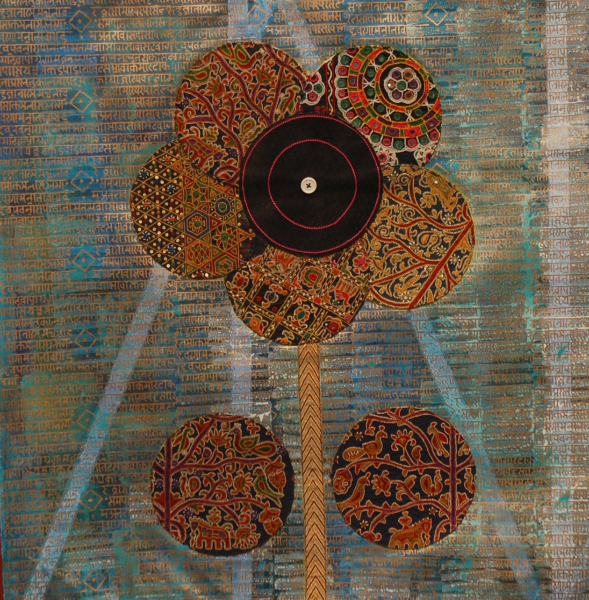 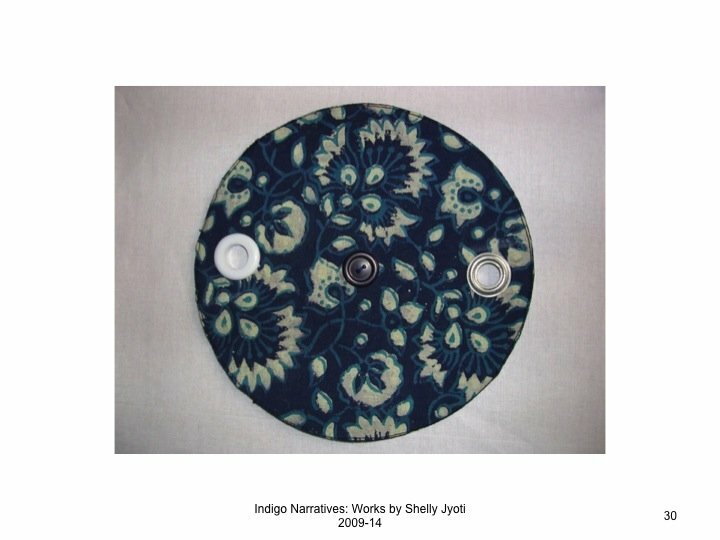 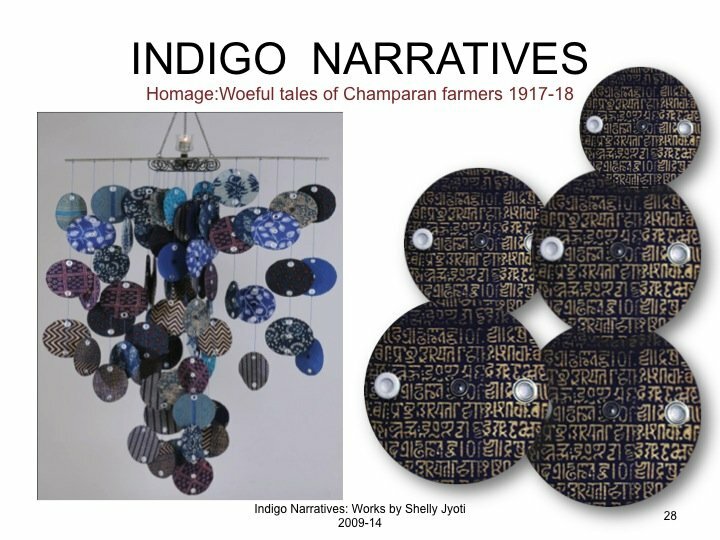 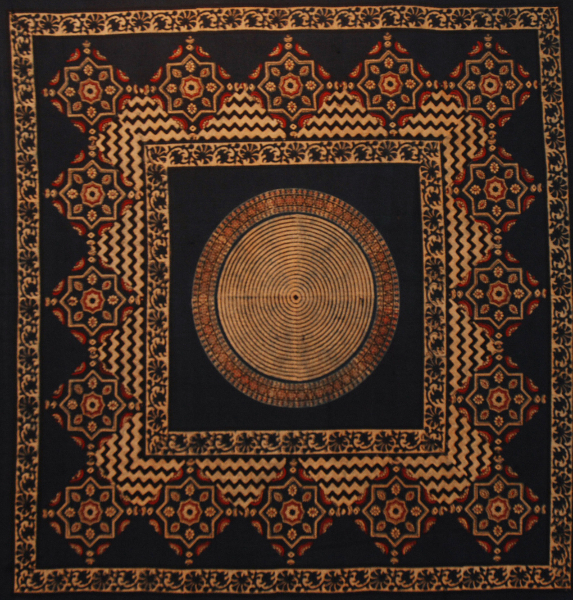 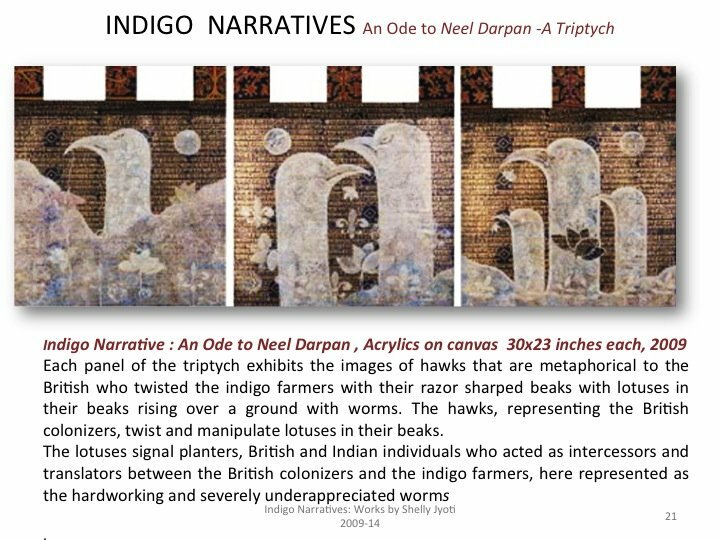 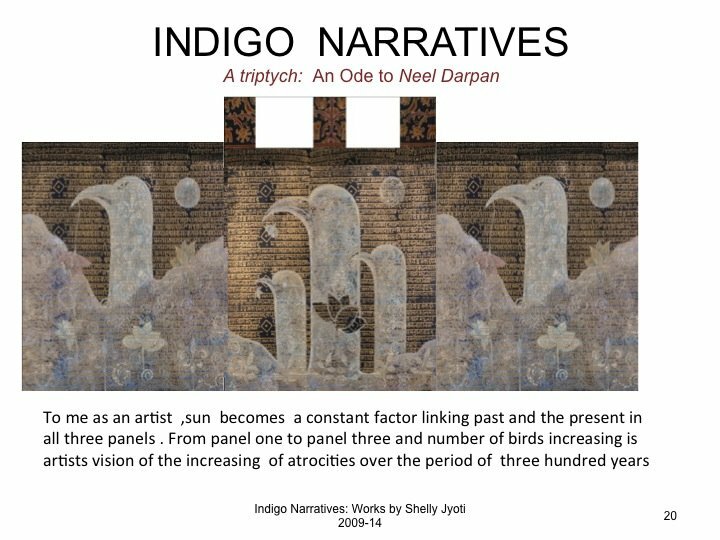 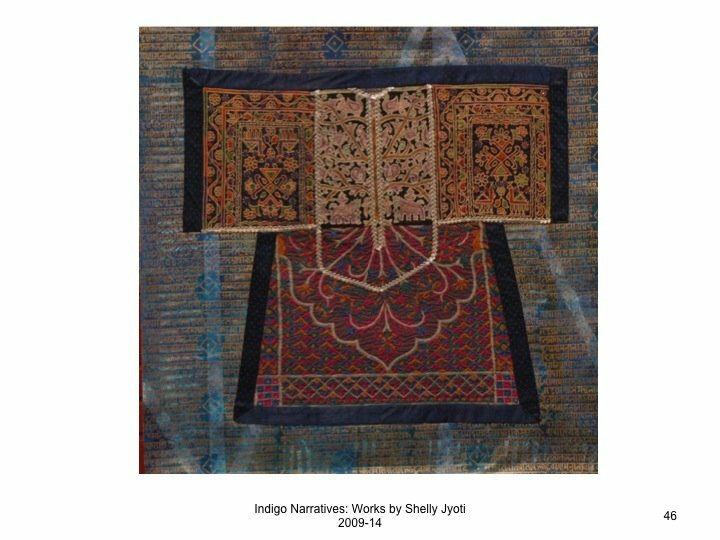 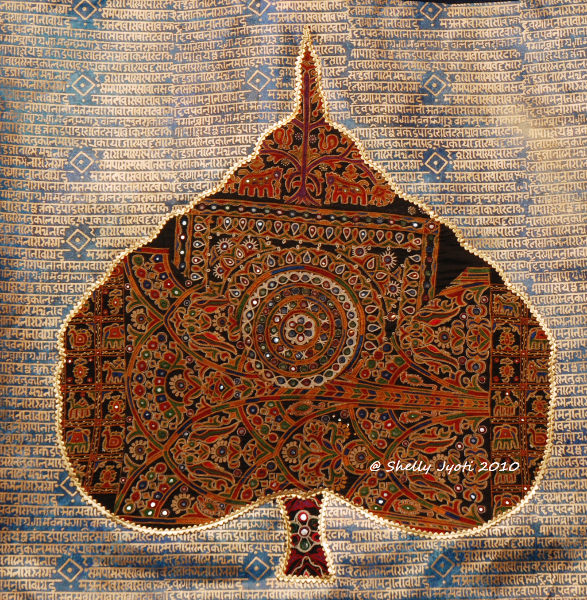 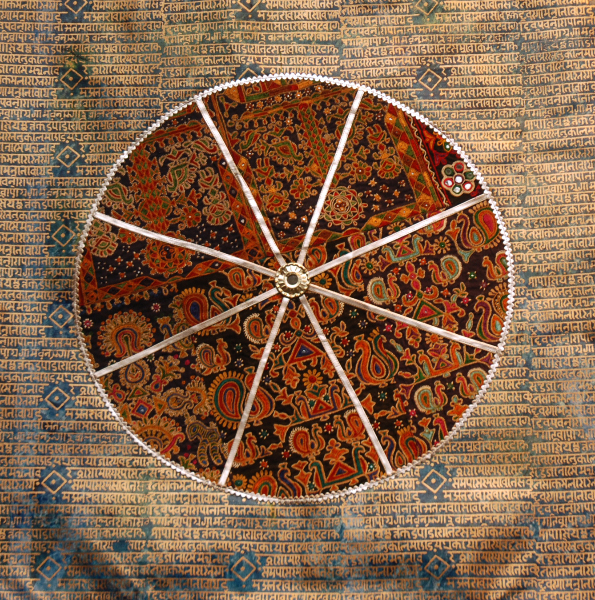 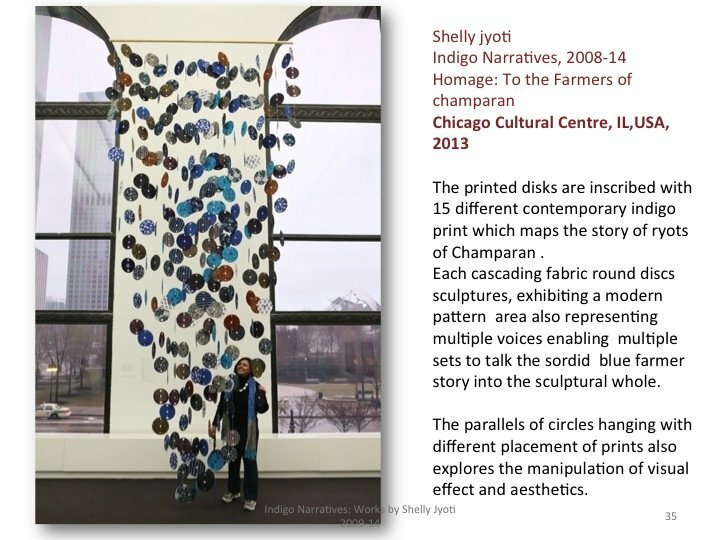 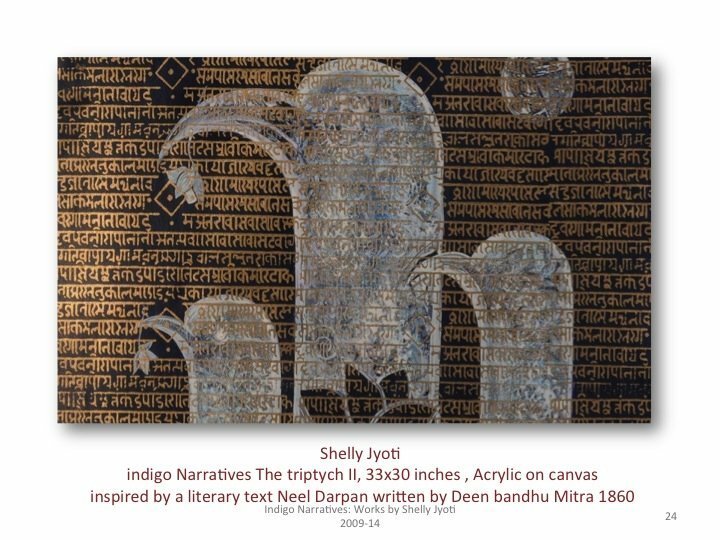 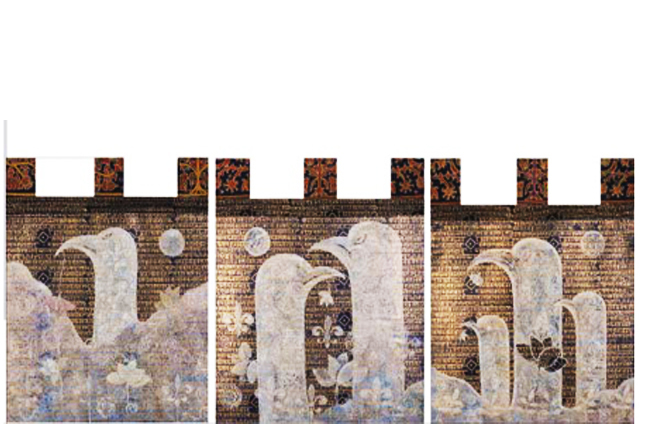 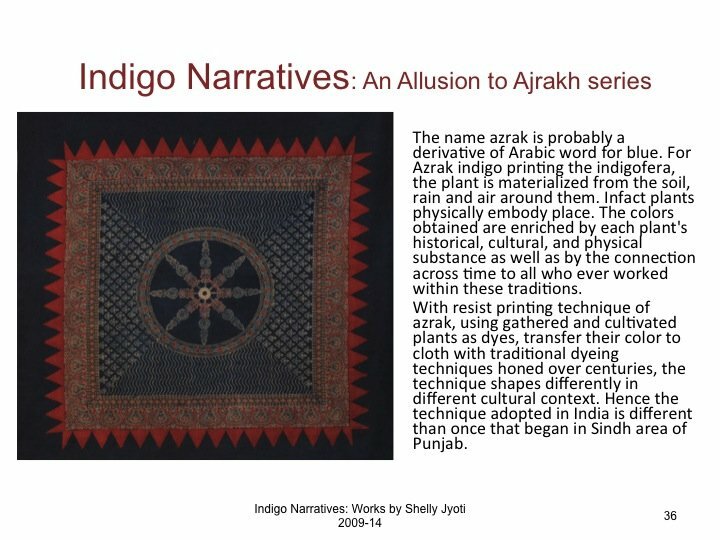 Indigo Narratives (2009) features sculpture, installation and paintings that incorporate hand embroidered textiles, azrak printing on khadi, and Sanskrit calligraphy. 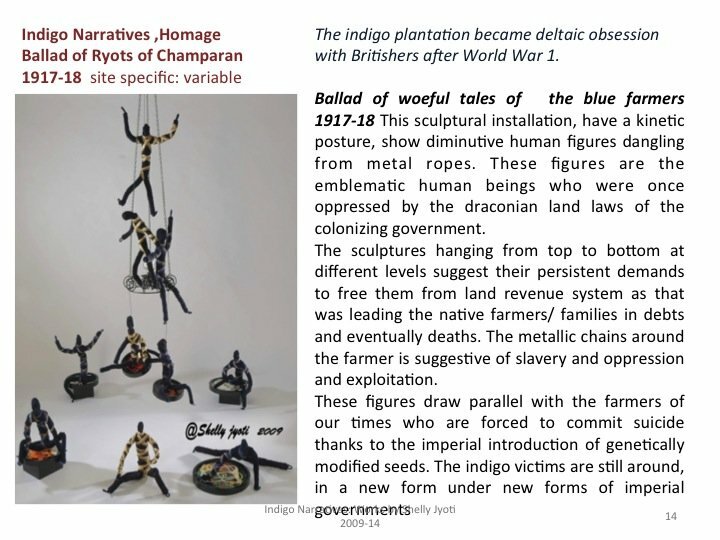 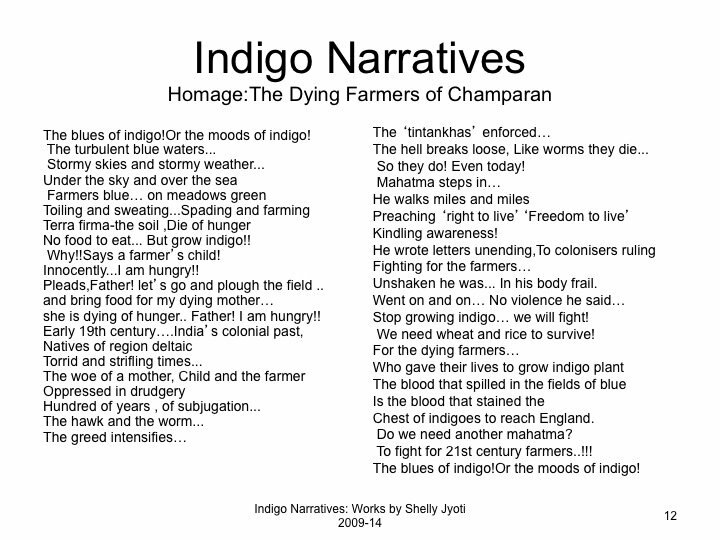 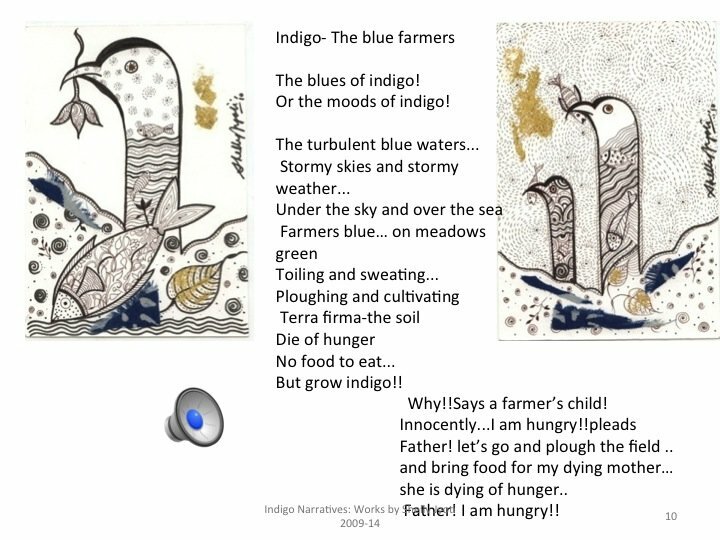 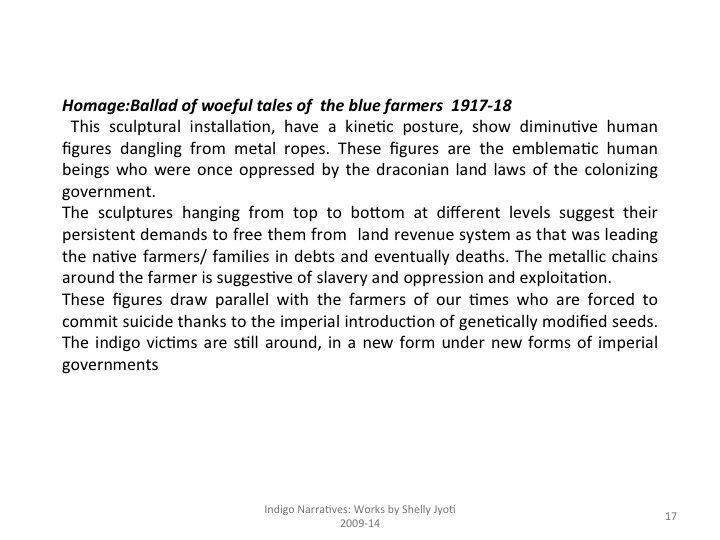 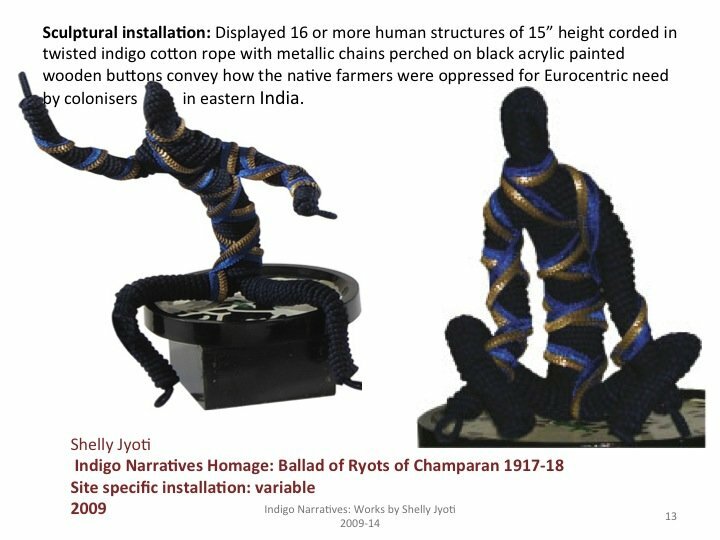 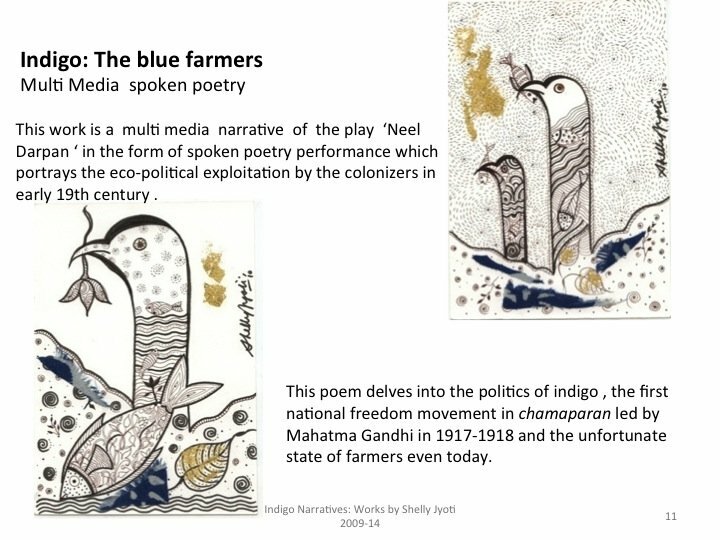 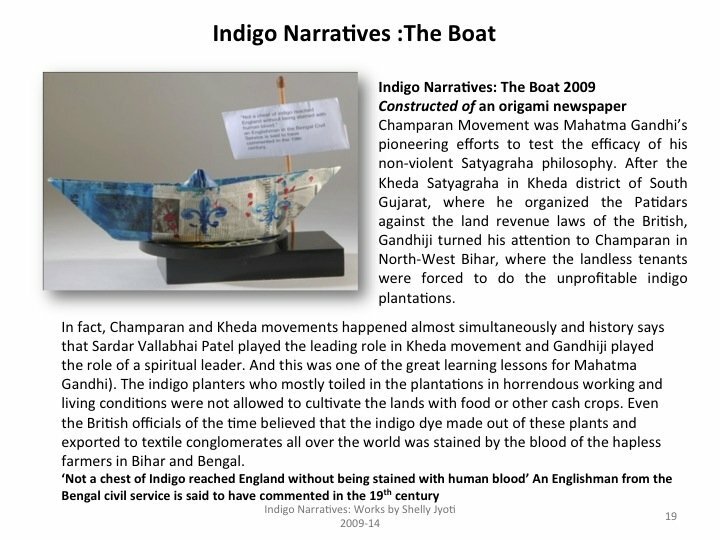 My narratives are inspired by the accounts of the tyranny of British colonial indigo planters on native farmers of chamaparan and Mahatma Gandhi’s subsequent intervention in Bihar 1917-18, the first satyagrah led by Gandhi on the Indian soil after his fight against racialism in South Africa. 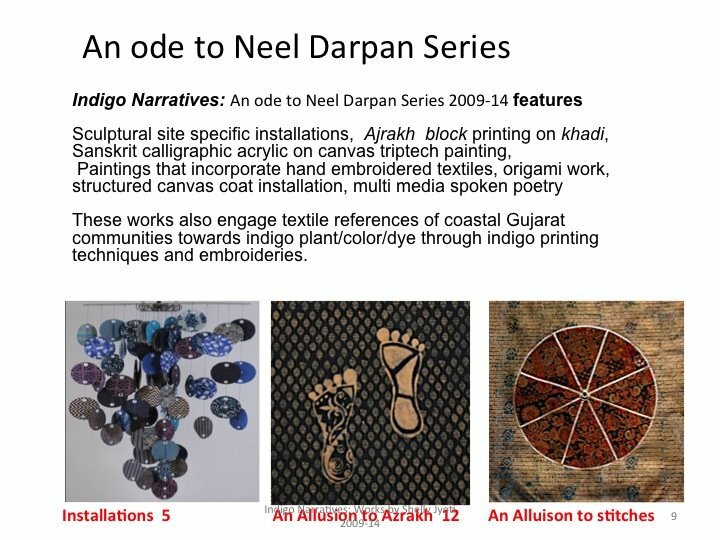 The works engage textile references of coastal Gujarat, literary texts such as Neel Darpan through the history of India’s colonial past along with references to indigo plant/color/dye. 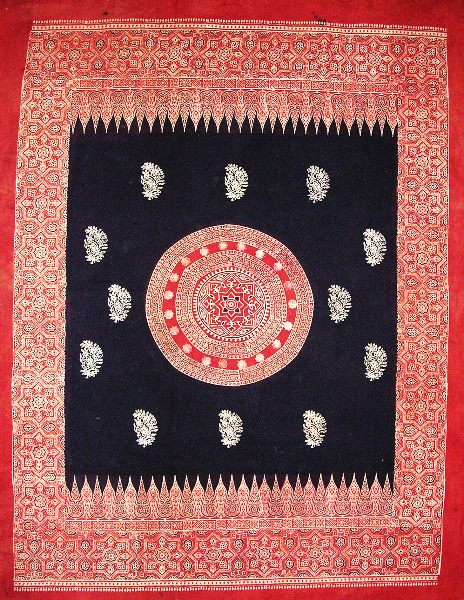 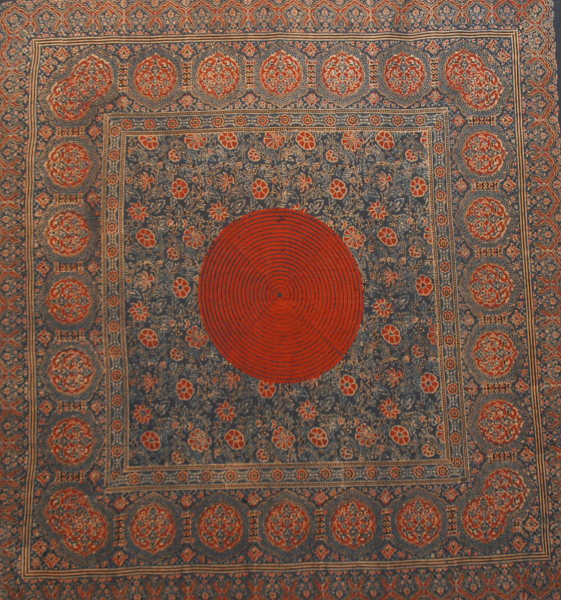 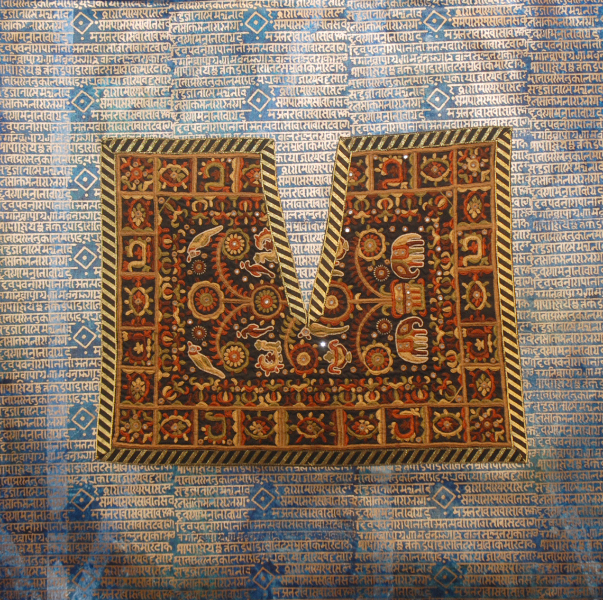 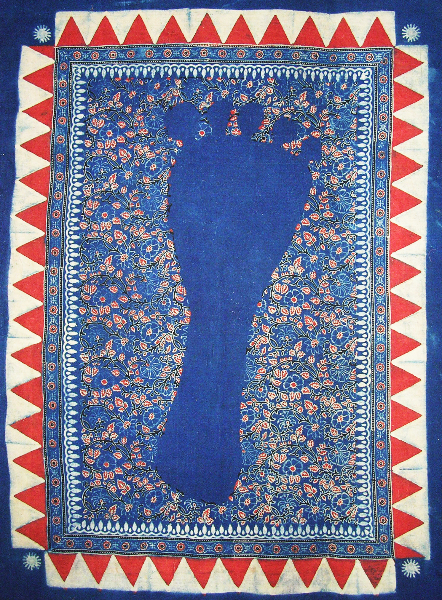 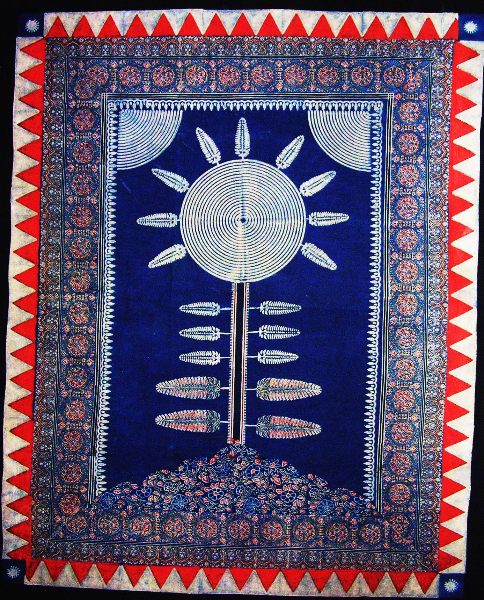 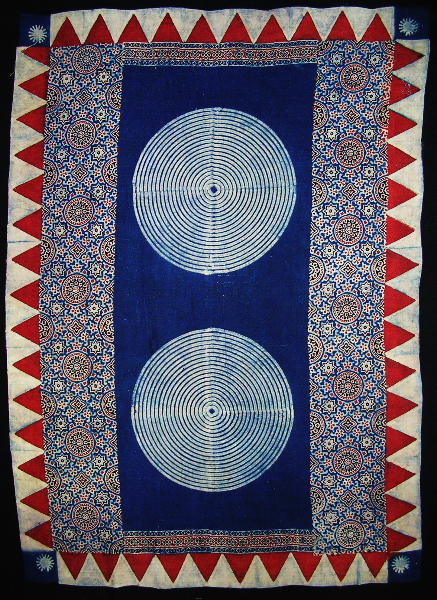 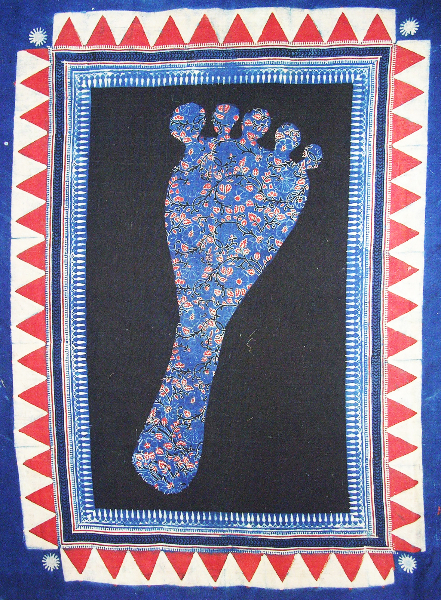 The use of azrak printing on khadi utilizes indigo techniques, which are used by khatris ,the immigrants from Sindh and Baluchistan during 1600 C.E. 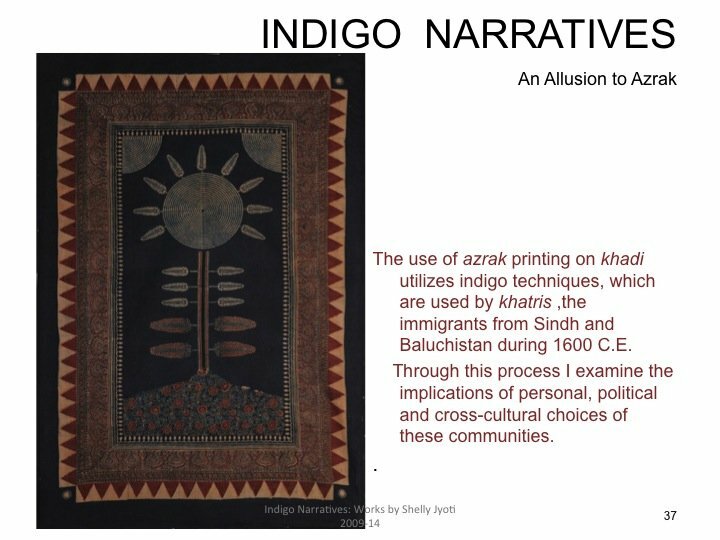 Through this process I examine the implications of personal, political and cross-cultural choices of these communities. 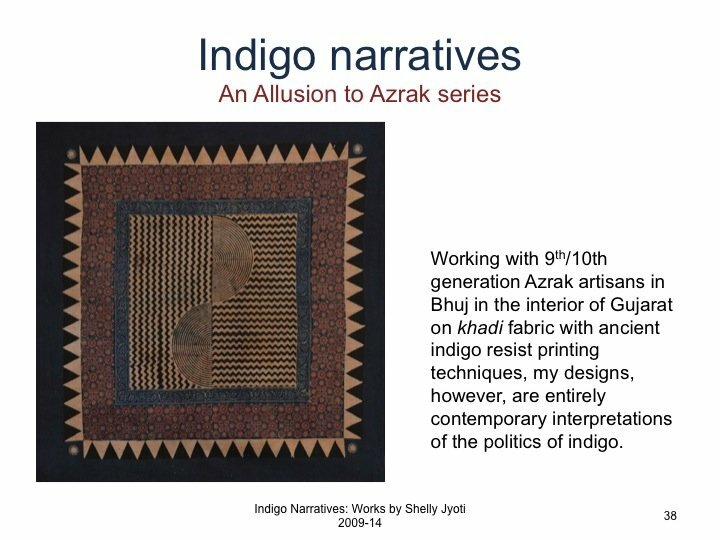 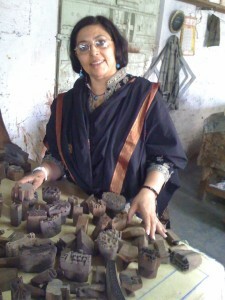 Working with 9th generation Azrak artisans in Bhuj in the interior of Gujarat on khadi fabric with ancient indigo resist printing techniques, my designs, however, are entirely contemporary interpretations of the politics of indigo. 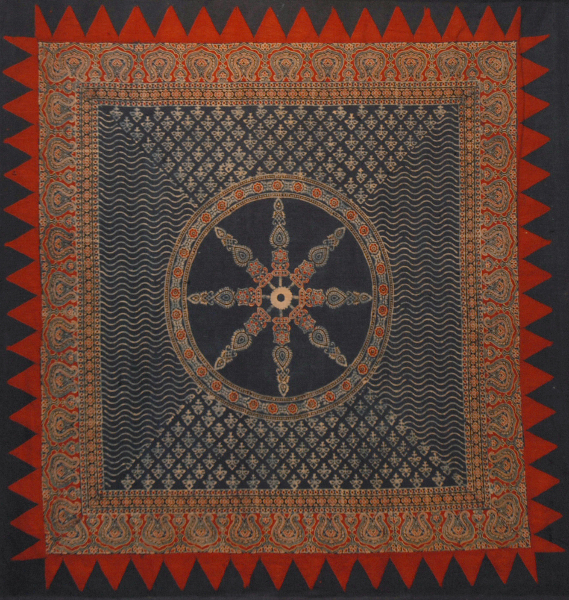 Also incorporating traditional designs motifs of different clans by artisans from fair trade women’s collectives such as Shurjan: Threads of Life and thus helping contribute to providing sustainable means of income for some of India’s under privileged women. 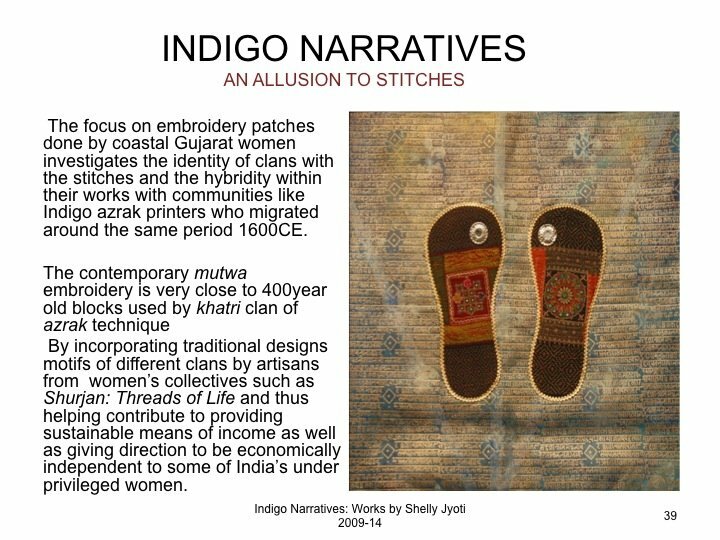 The focus on embroidery patches done by coastal Gujarat women investigates the identity of clans with the stitches and the hybridity within their works with communities like Indigo azrak printers who migrated around the same period 1600CE. 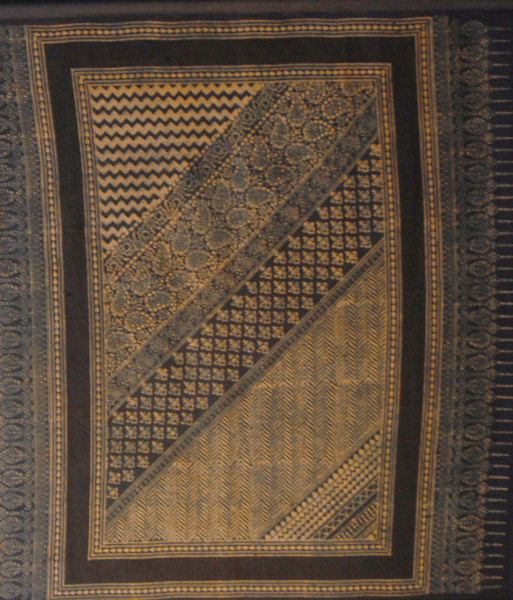 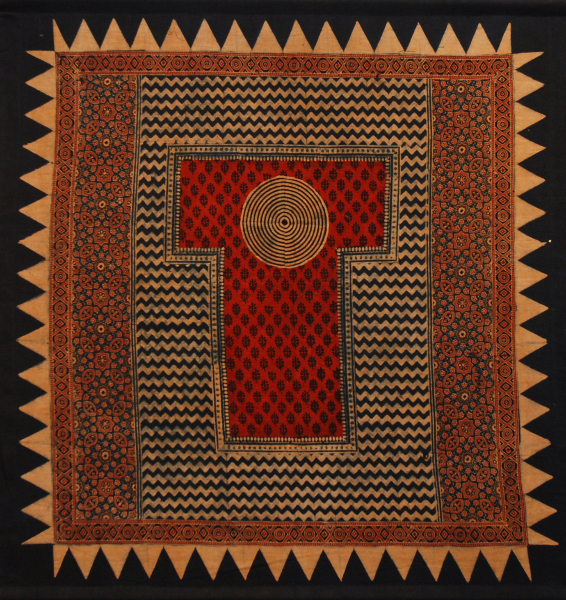 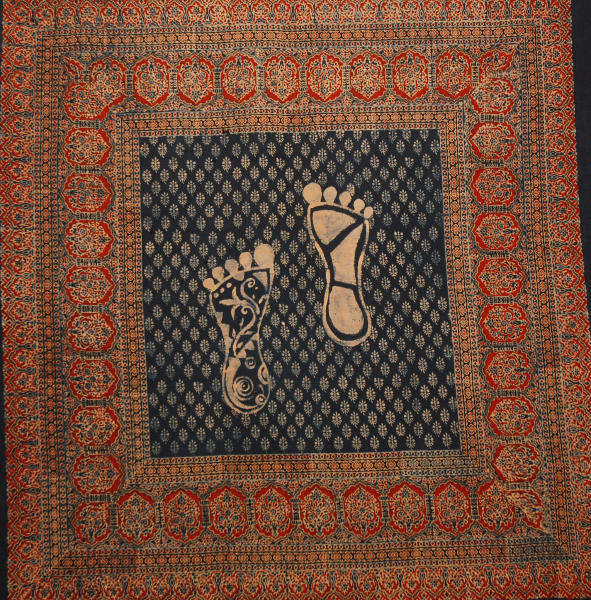 The contemporary mutwa embroidery is very close to 400year old blocks used by khatri clan of azrak technique. 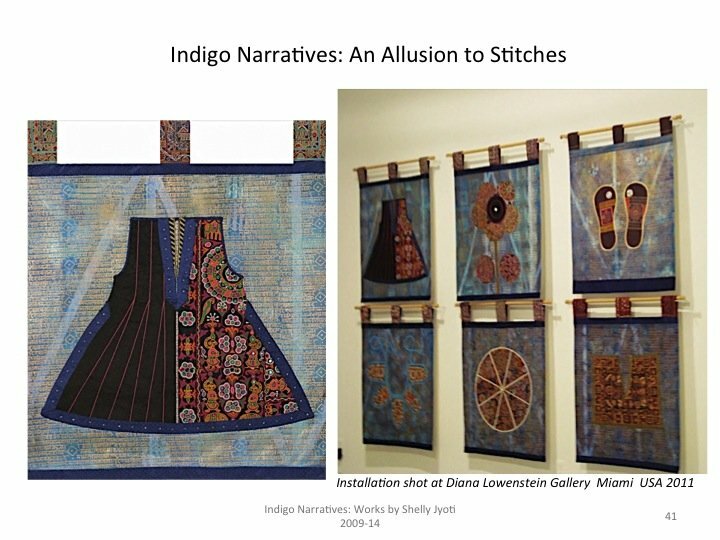 To me, textiles created for artwork performs a great sense of preservation as a visual medium for documentation purpose than compared to functional textiles. 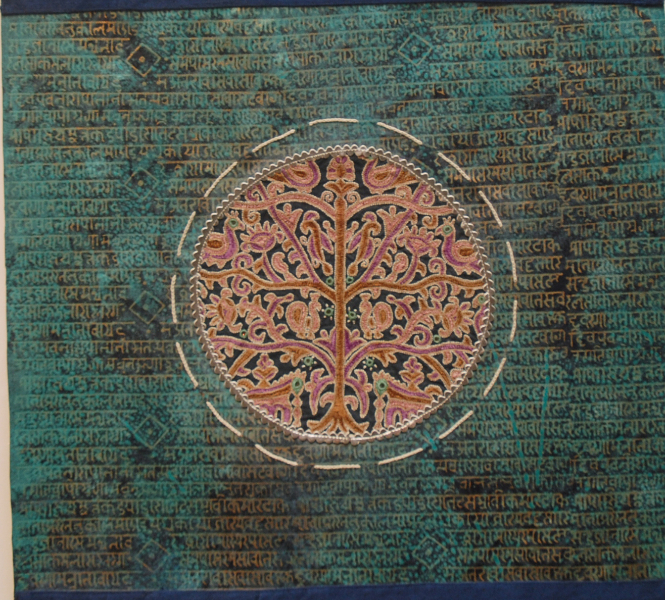 Both have symbolic purposes. 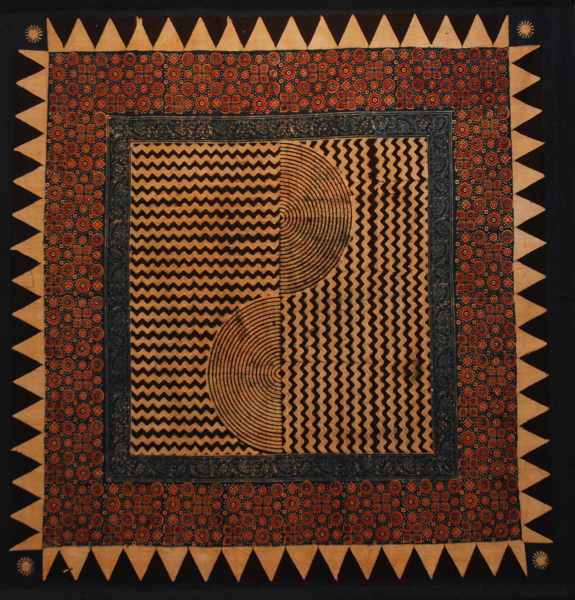 My artwork challenges me to apply this vision of traditional pattern block and color in the context of a socially and environmentally responsible design practice. 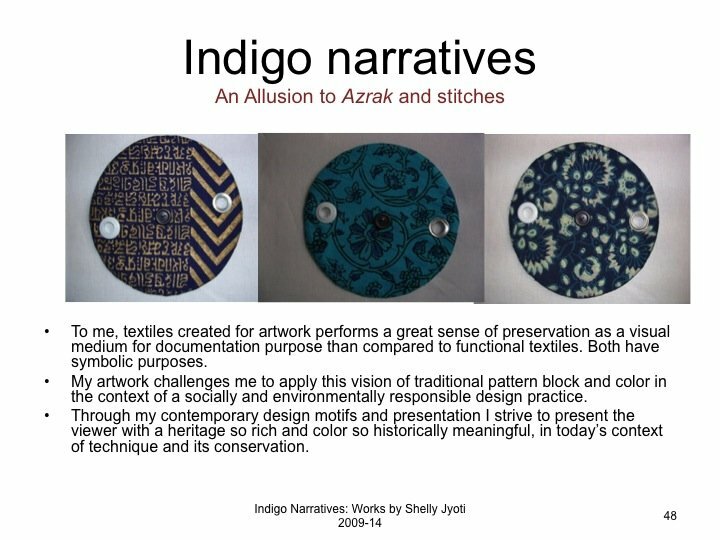 Through my contemporary design motifs and presentation I strive to present the viewer with a heritage so rich and color so historically meaningful, in today’s context of technique and its conservation. 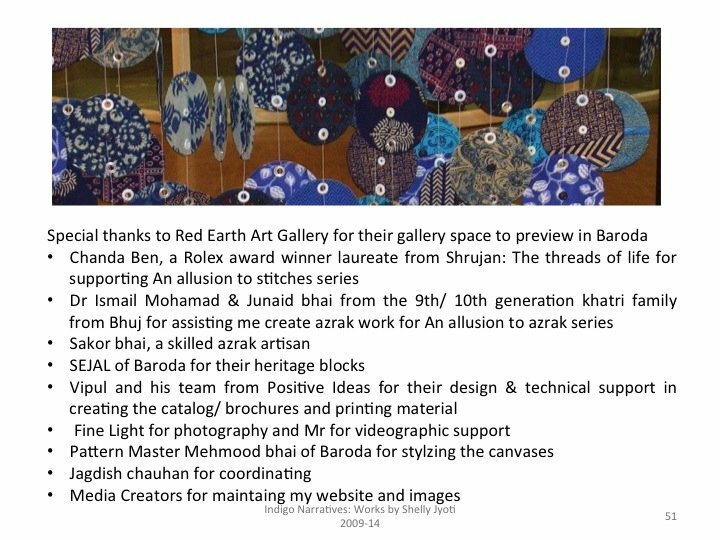 I would like to extend a special thanks to Red Earth Art Gallery for their gallery space to preview in Baroda , Chanda Ben, a Rolex award winner laureate from Shrujan: The threads of life for supporting An allusion to stitches series;Dr Ismail Mohamad & Junaid bhai from the 9th/ 10th generation khatri family from Bhuj for assisting me create eco- friendly azrak work for An allusion to azrak series;Sakor bhai, a skilled azrak artisan, SEJAL of Baroda for their heritage blocks; Vipul and his team from Positive Ideas for their design & technical support in creating the catalog/ brochures and printing material; Fine Light for photography and Mr — for videographic support,Pattern Master Mehmood bhai of Baroda for stylzing the canvases ,Jagdish chauhan for coordinating ;Media Creators for maintaing my website and images. 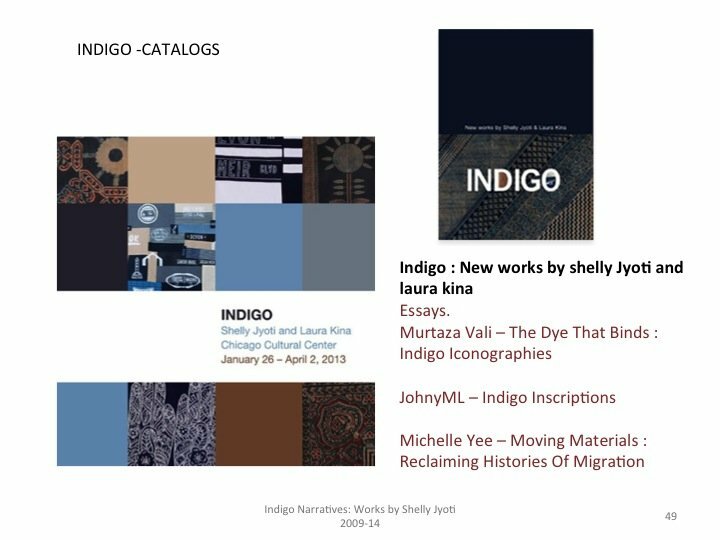 Most of all, lovable thanks to laura kina for sending positive vibes , her academic expertise and being a great team member which allowed seamless interplay of our multicultural ideas to coverage our concept indigo into a visual reality. 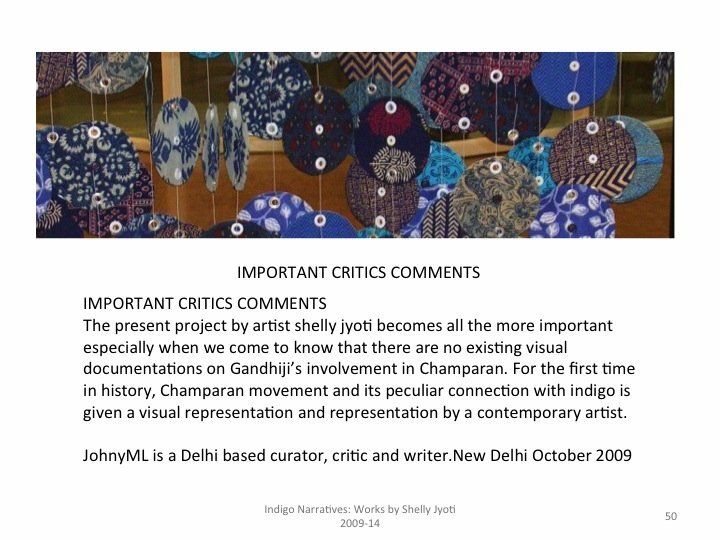 Skyping 24×7 kept us both focussed.Thanks to Shelly Bahl , New York based artist and friend for introducing me to Laura Kina in 2008. 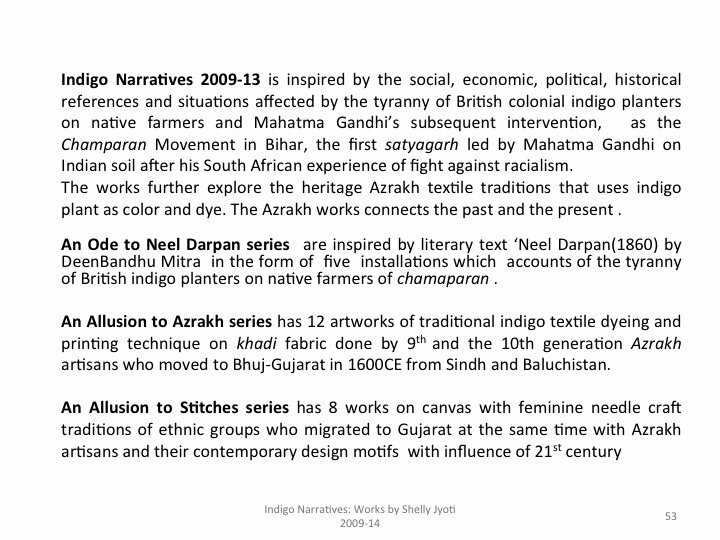 This project has been funded in part by grants from Gujarat Lalit kala Academy.